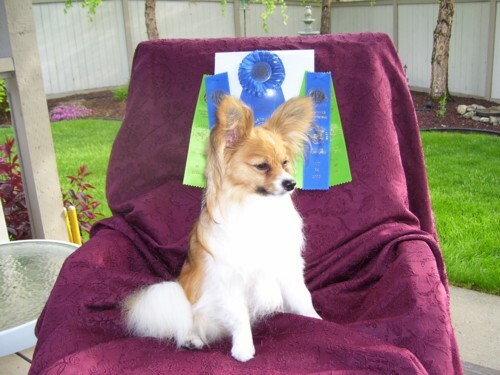 We are a small show kennel located near Richland, WA striving to produce Papillons who excel in temperment, movement, and health. Come inside to learn more about our dogs. We have had much success in the show ring since our beginnings in Papillons in 1995. Our first Phalenes were imported in 1998 and were featured on Animal Planet's "Breed All About It". 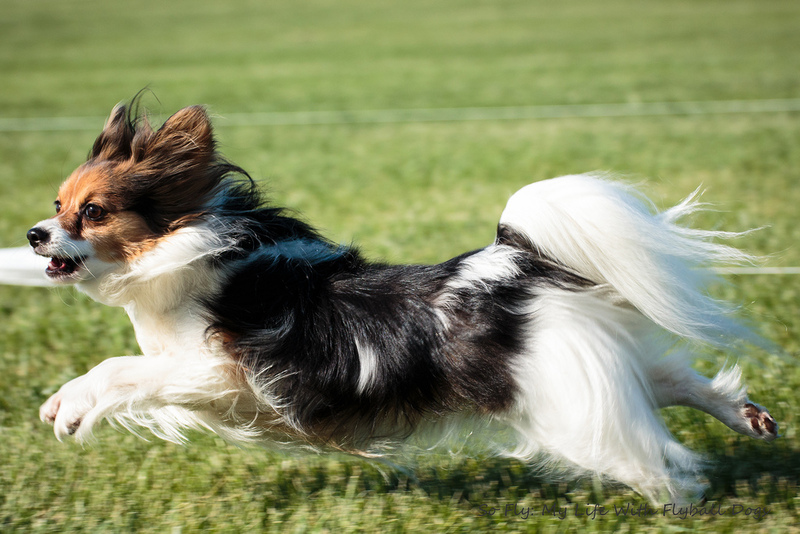 Since 2000 when we started breeding Papillons and Phalenes, 21 dogs have attained their Championships. 19 of those dogs are homebred, and 3 of those achieved Toy Group placements. We are very excited at the success of all our dogs, including Akai's A Thorn Among Roses, VCD2. That means he's a Versatile Companion Dog with advanced titles, and U-CDX Akai's White Water Running CD, Can CD, NA, NAJ, CGC. She will be working on her tracking title next. Another youngster by the name of Luca is starting his obedience training and doing very well according to his owner. We also have a 10 year old retired champion girl who earned her CD and Rally Novice titles. 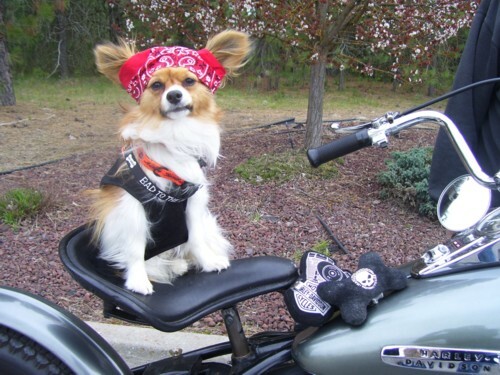 Harry, a retired Phalene is now learning agility with his new owner in the Seattle area! Rudy and Chloe are doing terrific as a phalene agility team in Oregon, although Chloe is beating the tar out of Rudy on the course in spite of him being the older, more experienced dog. 2 dogs are shining stars at local nursing homes in Wenatchee as well. 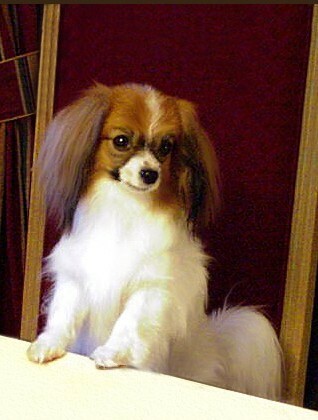 I'm a current member of the Papillon Club of America and a PCA club sanctioned mentor for both Papillons and Phalenes. My past affiliations have been: Lone Star Akita Club (past secretary), Rocky Mountain Akita Club, Buckhorn Valley Kennel Club, and Papillon Association of Puget Sound. 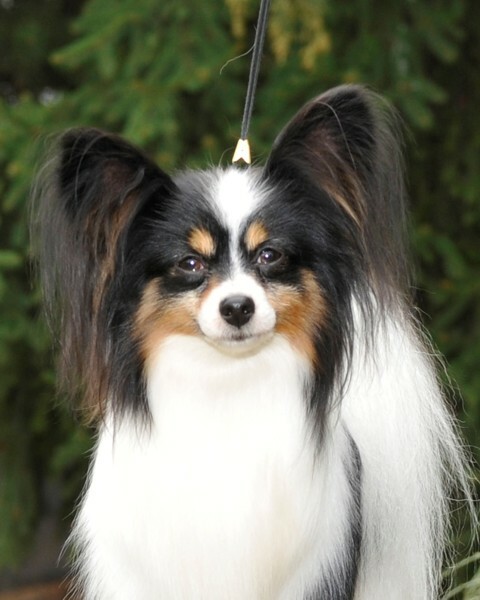 I have judged the Sweepstakes classes for the Papillon Club of Canada's National Specialty in 2003, as well as the sanctioned AKC 'B' Match for the Papillon Club of Northern California. 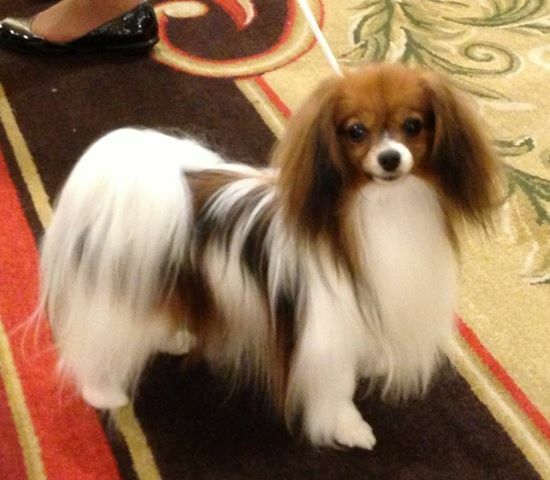 "Ronni", Akai's Diamond In A Rhinestone World, went BISS at the Papillon Association of Puget Sound (PAPS) Specialty in August, 2018. "Griffy", Akai's Dresden Green Diamond, went Reserve Winner's Dog for a 3 point major at the PCA National Speciality! The National Specialty was held in Louisville, KY at the end of May, 2013. Griffy's co-owner is Paula Bechler who keeps him in fabulous show coat! Rufio (below) was placed as a pet because I thought he had too much color and wasn't outgoing enough for the conformation ring. His new owner,Jacque decided to take some obedience classes in Spokane since she's never done it before. Over Memorial Day weekend, Jacque and Rufio got their CD with scores of 197, 195 and 197 and 1st Place all 3 days! They then went to the Lilac City Dog Training UKC trials and won Novice 1st place both days and an average of 195.5 out of 200 per trial. This team is on FIRE! I'm so proud of both of them. 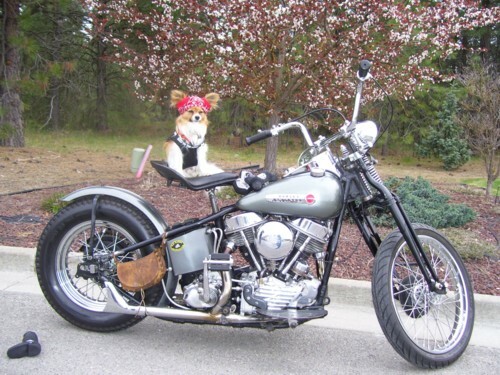 Below are pictures of Rufio on his daddy's motorcycle. Felix has a new favorite hobby - Lure Coursing. He is owned by Carol S.
Copyright © Marion Ford. All rights reserved.